Traveling is about feeling inspired, making discoveries and collecting meaningful memories. And all of that begins with learning a bit about your destination! Are you ready to find out some basic details about Midway? Midway is a neighborhood in Tallahassee, the state capital of Florida. It's located 10 miles (16 kilometers) west of the downtown area. Last time they counted, the population of Tallahassee was 180,000. With Travelocity, you'll score a great bargain if you lock in an accommodation and airfare package deal. You can also select from more than 400 airline companies and 665,000 lodging options. From airfares and accommodations to activities and rental cars, we can offer 24/7 personal assistance with our Customer 1st Guarantee. If you somehow come across a better deal elsewhere, we will refund the difference^. Adjustments to accommodation and airfare bookings will never incur any hidden fees from us. And as long as you get in quick, many accommodations won't charge you either^. Have you been eyeing off Midway? Then look up the 3 properties within close reach of the center of this popular neighborhood. Once you've done that, stop looking and get booking! We suggest the Comfort Inn And Suites (215 Commerce Blvd) and the Howard Johnson Inn - Tallahassee/Midway (81 Commerce Blvd). Secure your favorite and then start packing your bags. Where do you fly into for Midway? Admire the scenic view as you approach Tallahassee Regional Airport (TLH). Collect your belongings, pass through the security gates and you'll be around 8 miles (13 kilometers) southeast from central Midway. Can I rent a car in Midway? Book a rental car via Travelocity and discover Midway at your own speed. After you've disembarked the plane at Tallahassee Regional Airport, you'll be able to pick up a car right outside the terminal. It's pretty much impossible to pass by without seeing Budget and Thrifty Car Rental. Also browse the range at Alamo Rent A Car and Enterprise. Journey into the wider region and get closer to nature with some activities like mountain biking. If you really want to go home with some glorious vacation memories, throw hiking on your itinerary too. Havana is a good place to visit while you are in Midway. It is situated about 8 miles (13 kilometers) away. Situated in Midway, this hotel is within 9 mi (15 km) of Lake Talquin State Forest, Tallahassee Community College, and Mission San Luis de Apalachee. James Messer Sports Complex and Tallahassee Museum are also within 9 mi (15 km). 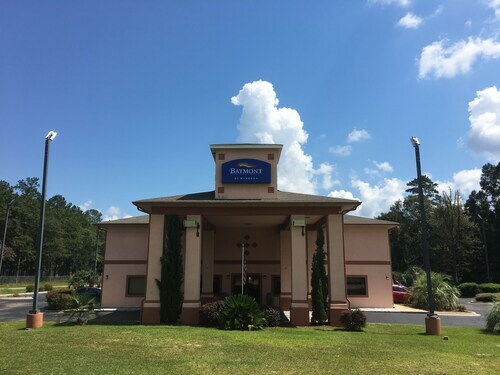 Situated near the airport, this hotel is 2.3 mi (3.7 km) from Lake Talquin State Forest and within 9 mi (15 km) of Florida State University and Tallahassee Community College. Mission San Luis de Apalachee and James Messer Sports Complex are also within 9 mi (15 km). Situated in the suburbs, this hotel is within 9 mi (15 km) of Lake Talquin State Forest, Tallahassee Community College, and Mission San Luis de Apalachee. James Messer Sports Complex and Tallahassee Museum are also within 9 mi (15 km). Situated in Midway, this motel is within 12 mi (20 km) of Tallahassee Community College, Tallahassee Museum, and Florida State University. Lake Talquin State Park and Lake Jackson Mounds State Archaeological Site are also within 16 mi (25 km). 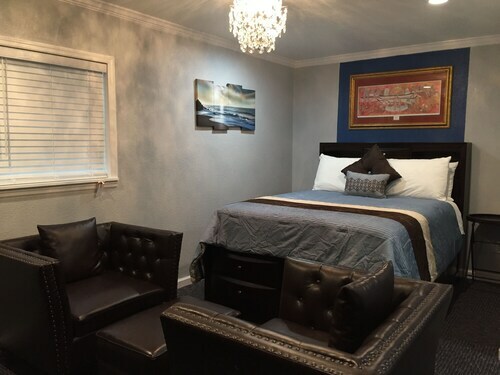 Situated in the entertainment district, this motel is 1.5 mi (2.5 km) from Governor's Square Mall and 2.9 mi (4.7 km) from Florida State Capitol Building. Hilaman Golf Course and Governor's Park are also within 3 mi (5 km). 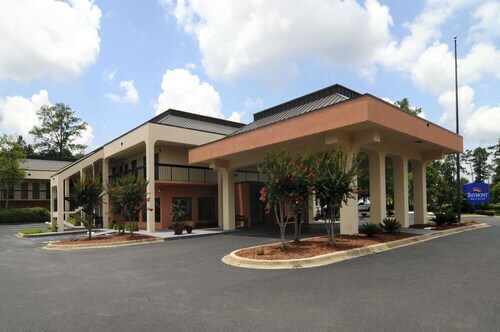 Situated in Tallahassee, this hotel is within 3 mi (5 km) of The Centre of Tallahassee, Levy Park, and Lake Ella Park. Lake Jackson Mounds State Archaeological Site is 3 mi (4.8 km) away. 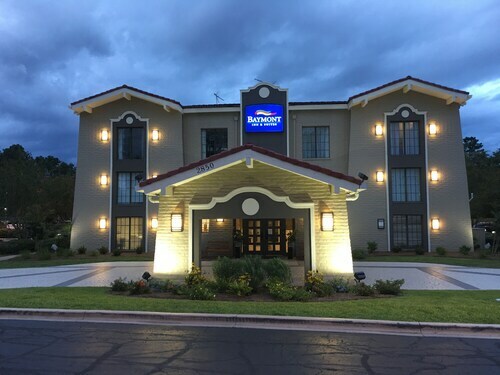 Located in the heart of Tallahassee, this hotel is 1.1 mi (1.8 km) from The Centre of Tallahassee and within 3 mi (5 km) of Levy Park and Lake Ella Park. Theatre Tallahassee and Winthrop Park are also within 3 mi (5 km). Situated in Tallahassee, this motel is within 3 mi (5 km) of The Centre of Tallahassee, Levy Park, and Lake Ella Park. Lake Jackson Mounds State Archaeological Site is 2.9 mi (4.6 km) away.